Cumbria Classic Coaches have taken delivery of a more modern vehicle which will be used on their various registered services. 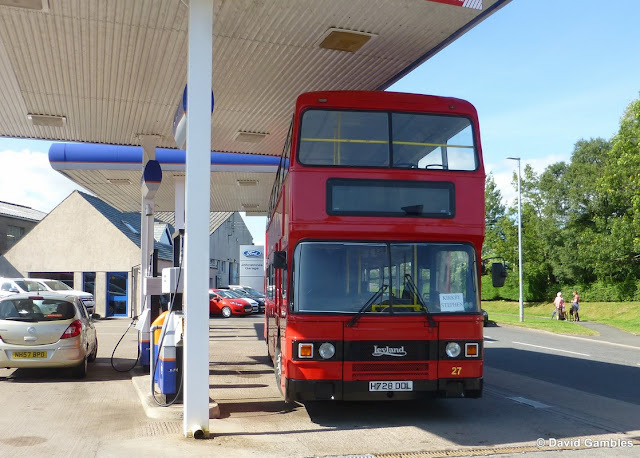 The vehicle is a Leyland bodied Olympian, registration H728 DDL first registered in 1990 to Solent Blue Line which then was an integral part of Southern Vectis, hence the DDL registration. Photographs taken in 1990 of the hand-over of the new vehicles to Solent Blue Line show H728 DDL with 'Winchester' on the destination blind. Whether it ever operated on the Isle of Wight in subsequent years is unknown. The vehicle was owned latterly by Stagecarriage of Middlesbrough. On Thursday 9th July the bus carried out its first journey for CCC, operating the 570 Kirkby Stephen - Shap - Kendal service. Staff from the Shap Wells Hotel board the bus, seemingly in the middle of nowhere. Council who have withdrawn funding for all rural bus services. Passengers seemed somewhat amazed to see the vehicle in place of the usual Bristol Lodekka or AEC Regent, but soon began to pay compliments as they settled into the journey, the air suspension soaking up the many pot holes along the route. Kendal, and the end of the outbound journey and the flags are out! Passengers have three hours to do their shopping before the return journey which departs at 14.55. Cumbria Classic Coaches registered the two additional Kirkby Stephen - Kendal services - one on Mondays (571) and one on Thursdays (570), after Cumbria County Council withdrew funding for bus services within their area leaving many residents stranded. The new vehicle will be a useful addition to the fleet and should help to minimise mileage on the heritage vehicles. A nice bright, smart interior with lots of elbow room. I drove the return Kendal - Shap - Kirkby Stephen journey and was able to sample the modern delights of power steering and air suspension. As passengers left the bus they all paid complements to the 'new' vehicle but most of them took the trouble to say that they still like the 'old ones'! Timetables here Note. As from Thursday 16th July the 570 route is amended to start from Ravenstonedale and head direct to Shap. It will no longer pick up in Kirkby Stephen.